Dylan’s version of “Maggie’s Farm” at the 1965 Newport Folk Festival was a quite a different interpretation than the version he played at the 2011 Grammy award show. At the Grammys, Dylan stood in front of his longtime crack band as well as newer folk acts Mumford & Sons and The Avett Brothers, who had each performed a song of their own (“The Cave” and “Head Full of Doubt, Road Full of Promise,” respectively) in the three-artist mini-set. Dylan’s original version of “Maggie’s Farm” was recorded in New York City on a January 1965 session and was released in March later that year on the album, Bringing It All Back Home. Dylan set the album version to a rollicking Chicago electric blues, a sound that in recent years he has shown great interest in. Also notably, “Maggie’s Farm” is the first song Dylan played in his Sunday night set at the 1965 Newport Folk Festival, backed by members of the Paul Butterfield Blues Band like Mike Bloomfield on electric guitar. As Dylanologists have long noted, “Maggie’s Farm” stands as the second appropriation of the traditional song “Penny’s Farm,” first recorded by North Carolina’s Bentley Brothers in 1929. Dylan would have known the song from the the 1952 Anthology Of American Folk Music, widely called the “Harry Smith Anthology,” which was making the rounds of the folk community with great fluidity at the time. Dylan would have known the original version – “It’s hard times in the country, out on Penny’s farm” – and likely would have played it as a folk standard before spinning it off into “Hard Times In New York Town,” making very few changes to the lyrics and melody. “Come you ladies and you gentlemen and listen to my song” sound familiar? But by the mid-’60s, Dylan had taken the idea of the original “Penny’s Farm” — essentially a rural tale venting against a dishonest landlord — and created “Maggie’s Farm,” which has often been seen as one of Dylan’s kissoff songs to the folk scene, though the song is also filled with political overtones and personal reflection. Lyrically, the song essentially follows the themes of oppression and conformity but makes creative use of imagery like a bedroom window filled with bricks. While many have seen overt political messages in the song, it’s also hard not to see the song in the context of Dylan’s boredom with the folk scene. “Well, I try my best, To be just like I am, But everybody wants you To be just like them,” he sneers. “They sing while you slave and I just get bored” (a loose snub at Sing Out?) could even set up a distinction between singing traditional songs and the more challenging work Dylan sought, writing original songs and forging new musical directions. But Dylan also keeps the tenant farmer analogy going. The speaker’s reluctant to do house chores and hopes for rain to shirk his field work duties. Meanwhile, “I got a head full of ideas that are driving me insane” seems deeply personal. Was Dylan’s choice for “Maggie’s Farm” during the Grammys inspired by current politics? In a June 2008 Rolling Stone story, then-Senator Barack Obama said the “political rhetoric” of the song especially appealed to him as he sought the presidency during the heated campaign season. 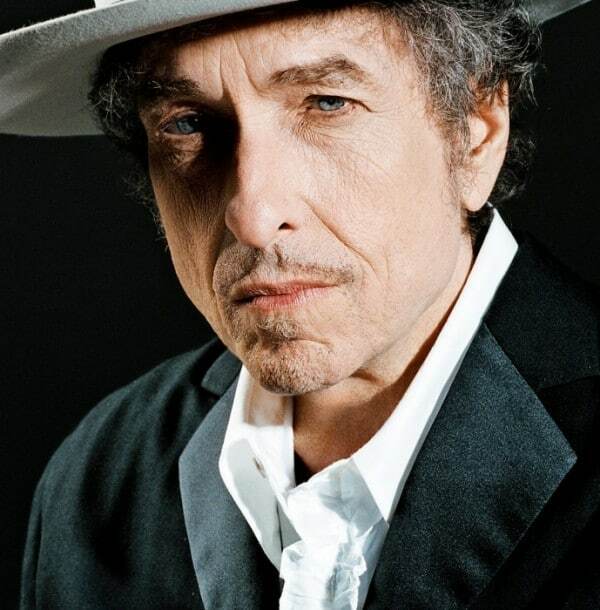 Though the transition from Mumford and Avett to Dylan proved a little dicey, and the sound of 15 younger and more energetic musicians largely drowned out Dylan’s voice, the 69-year-old legend actually looked like he was having fun at the Grammys, bending his knees slightly and raising his arms out to his side histrionically during the performance. He was clearly invigorated by his younger and admiring backup players, and in a nicely-arranged outro, led the band through chord changes with his harmonica. Watch the eight-plus minute clip of all three songs below.